Evidently it's a Phaidon list and not everyone who is anyone is on it. Light-sensitive emulsion, also known as photo-emulsion, is wonderful for making certain kinds of stencils in screenprinting. In particular, it's useful for reproducing detailed ink drawings with fine delicate lines which would be difficult to do any other way. On the down side, timing the exposure correctly is tricky. If the time is too short the image will wash out too much. If it's too long, the image may take forever to wash out and parts may not wash out at all. So, getting the timing right is of the essence. There's no hard and fast rule because every set-up is slightly different. The one good rule is to do a series of timed exposures to establish the best time for one's specific set of variables. 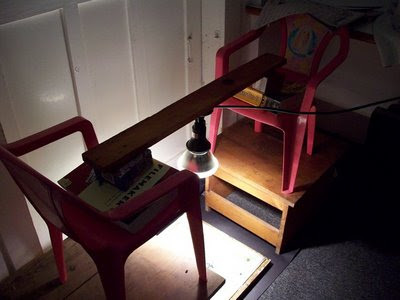 My variables are: A 150-watt flood lamp; distance from lamp to screen, 17 inches; diazo photo emulsion on the fabric side only (underside). After doing a series of test exposures (2, 4, 6, 8, 10 and 12 minutes) the optimum time turned out to be 5 minutes. This is an amazingly useful thing to know. I had been using much longer times and was having a terrible job washing the emulsion out. 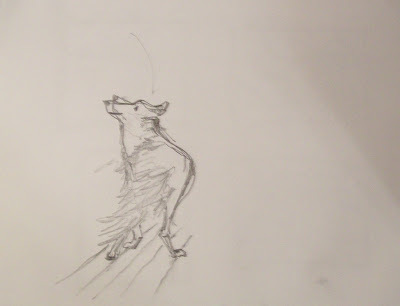 Looking through my sketchbook for something to post, I found this pencil drawing of Joseph Beuys's coyote from I like America, America Likes Me (video), done many months ago, approx A4. These days my sketchbooks look more like the one below, a combination sketchbook/journal/logbook. with things stuck in at will and still evolving.